ARCPANEL understands that one roof doesn’t fit all projects, which is why we have developed a fully customised roof system that can be accurately manufactured to your design and structural specifications. Every roof panel is constructed to your precise engineering requirements at our state of the art factory and delivered to site when you need it. ARCPANEL has preserved the unique Australian characteristic of corrugated iron and added insulation (EPS core) to create high strength roofing systems. An ARCPANEL roof system is a complete roofing solution which reduces on-site trades and labour components. Custom manufactured to your architectural and design requirements, the innovative ARCPANEL roof systems allow you to design without boundaries, whilst significantly reducing structural and labour components. Rated up to C4. 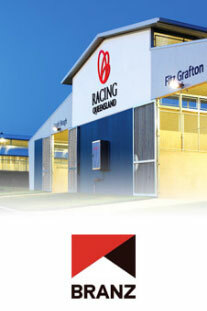 ARCPANEL roof panels are listed on the NT government Deemed to Comply manual as an approved product. ARCPANEL panels achieve industry leading spans of up to 12.8 metres, cantilevers of up to 4.5 metres and are faster to install than a conventional roof. ARCPANEL roof systems have been certified with Group 1 fire rating in accordance with the fire hazard properties of BCA C1.10a. ARCPANEL can offer material options that are suitable for marine or corrosive environments with warranties up to 25 years. Up to 25 years warranty available – for peace of mind (subject to conditions). R-value rating of 6.5. An ARCPANEL roof reduces heating & cooling requirements providing a higher comfort level, reducing energy costs. ARCPANEL roof systems are suitable for use in multiple applications including residential, patio’s, awnings, carports, multi-residential, commercial, educational, defence and public buildings.